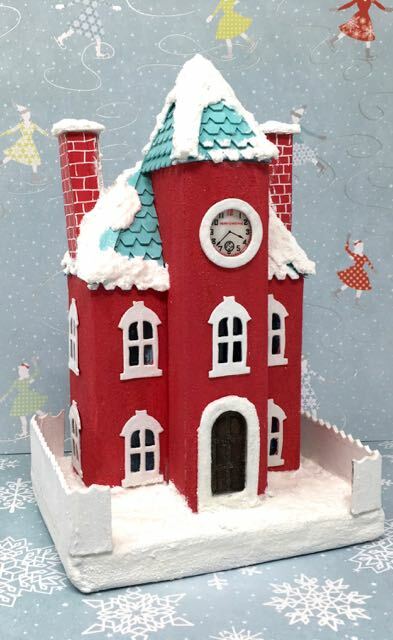 Kelly’s Christmas Clockhouse is a Christmas Putz house designed with a hipped roof, double chimneys and a glittered, snowy clock tower in the front. 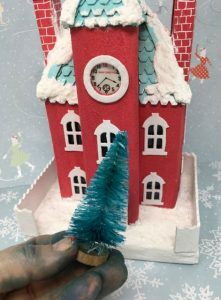 The little Putz clock face says “Merry Christmas.” This particular glitter house is based on the pattern I used for the Wilkins House – my largest Putz house to date. But I made the pattern for this little cardboard house is smaller and easier. You can find the pattern here in the Paper Glitter Glue library under Front Tower Clockhouse. 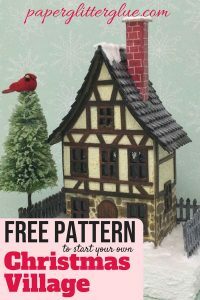 The pattern is just slightly modified from the Kelly’s Christmas Clockhouse below. Subscribe to my newsletter to get all my up-to-date information on the blog and to get access to the library where you can download that pattern and so many more. 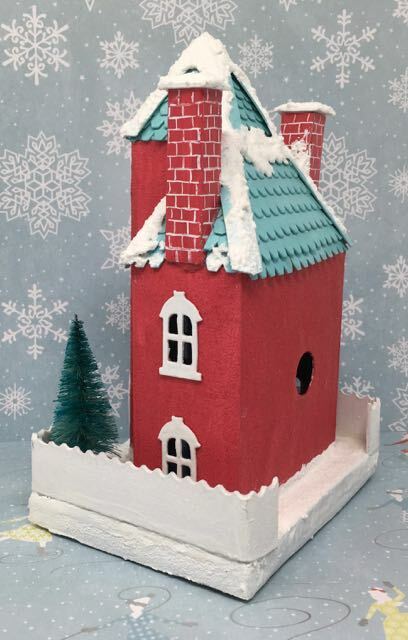 I’ve been working on this glitter house for a friend who recently had surgery and I wanted to send her some good wishes in the form of a Putz house. But I’m never sure if someone would like a Halloween house or not so I figured a Christmas glitter house is a safer bet. Otherwise, you know I would make a Halloween house. While this house is based on the pattern for the Wilkins House, it is modified to make it smaller and easier. 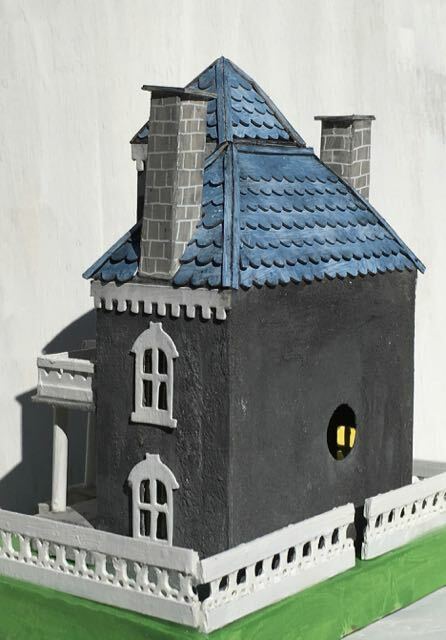 You may recall (or not) that I made SEVEN prototypes to make the Wilkins House to be auctioned off for my local chapter for Habitat for Humanity. The Putz prototype before the final pattern turned into the Spring Mansion. I really like this house except that several features on it are sort of wonky and crooked. For that reason, I left off the porch on Kelly’s Putz house because that’s where I always have trouble with wonky details. That’s part of the simplification process in this putz paper pattern. 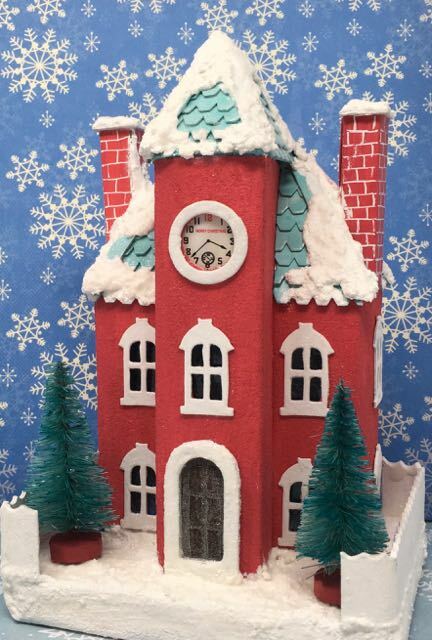 So here is Kelly’s Christmas Clockhouse. The basic house structure in itself is pretty simple with a hipped roof and tower added to the front. What makes it challenging is making sure the angled part of the tower fits on the roofline. Then the next challenge is putting the roof on straight. That part always gets me. On Kelly’s house the tower roof tips back a little bit – kind of like a cowboy with his hat tilted back. You can see it pretty clearly on the photo below. What happens is you put the roof on and you configure it one way, then you realize that leaves a gap in the back and you tilt it back a little bit. Then you check the front and it appears to be straight so you call it good. But you forget to check if it is angled or not. That’s how it happens to me anyway. You may be more precise than I am and not run into these problems. Why I am telling you this? Because I want you to know that even someone who makes lots of houses has construction woes as well. While I think the back angled roofline looks kind of cool, it also looks odd to me. So on the next version of this house I am going to make the house a little shorter and the tower a little taller. That will give better separation to the tower roof and the house roof. For some reason, I think this roofline looks better on the Spring Mansion. Ignore the wonky details, ok? Remember it’s a prototype. In any case, the pattern has a different roof profile. Two things I really like on the Putz clockhouse are the clock itself and the paneled door. 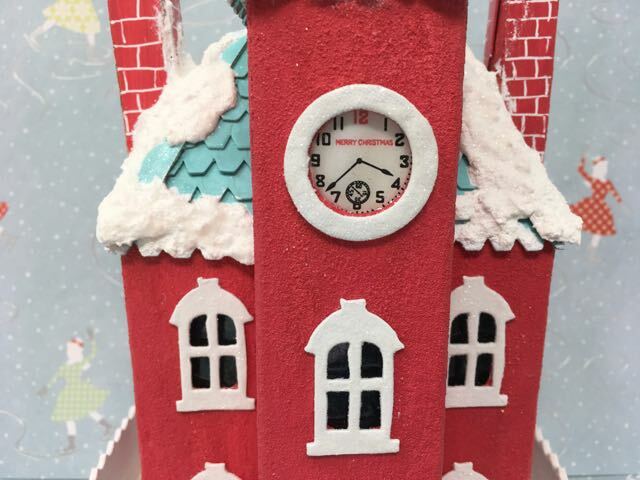 The Christmas clock template came from Paul Race’s Cardboard Christmas website. You can download it by clicking on that link. It’s free. Now for the paneled door. 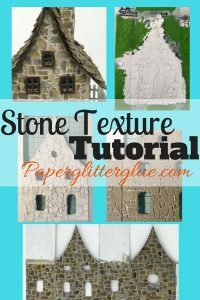 If you have visited my blog before, you know I love Tim Holtz products – particularly the Sizzix die cuts. 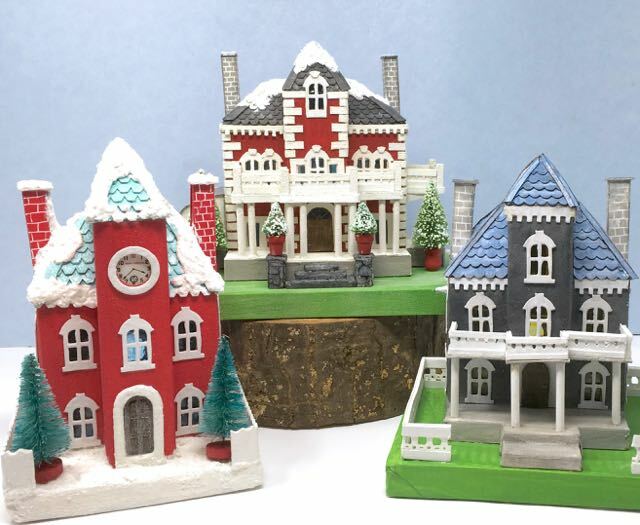 My favorite windows of all time are the windows on the Sizzix Village Manor die. I decided to use the leftover pieces from these windows as the panels on the door. The door itself is cut from a die called “Village Fixer Upper.” What a great name for die that includes windows and a door and shutters! Anyway, I glued six panels to the door and painted it with shades of brown Distress paints to make it look like wood. Because I wanted some texture on the surface of the house, I coated the entire house with Ranger Distress Grit-Paste. It makes the paint look like stucco. Most of the paints are from the Ranger Distress line of paints. I really only used 2 colors on the house itself. The body of the house consists of Festive Berries over the grit-paste coating. The roof is painted with Tumbled Glass Distress paint. To mimic wood, I usually do several layers of paint starting with a light color – Fossilized Amber – in this case, then Brushed Corduroy and finally Ground Espresso. The door is a little darker than I would like. 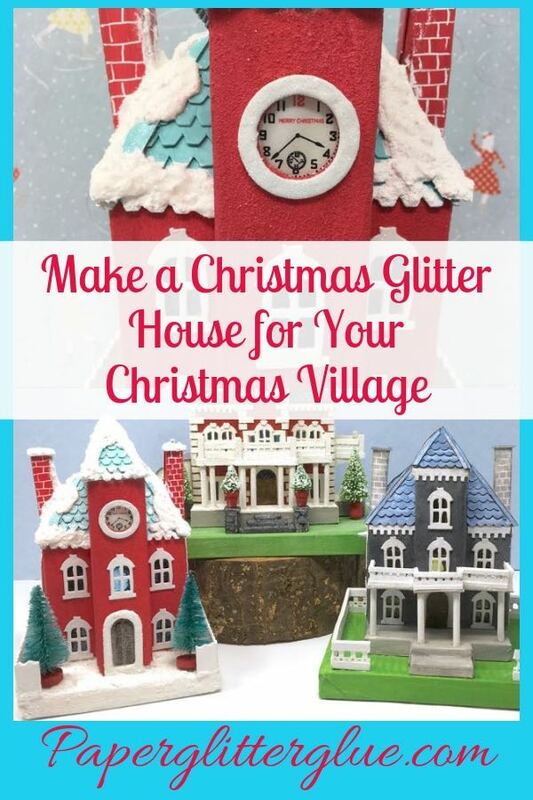 In general, I don’t cover a lot of my putz houses with glitter, but I thought this putz house required some glitter. 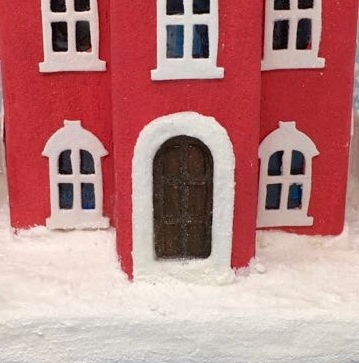 I painted each window and the door frame with white gesso and used a very fine clear glitter on top. I feel that the snowy areas require glitter as well. So I coated all the snow and the roof with a light layer of Mod Podge and then glittered these areas. I did the same with the fence. Since I’ve finished the house, I realize I needed to either add more detail on the fence as in some cutouts or to paint it a different color. It’s a little late for that. I’ll do better on the next putz house. Since the fencing was so bland, I needed something to spice up the base. Bottlebrush trees work nicely for this purpose. The only problem was that I didn’t have a good color to match the house so I stained some trees with Distress spray stain in the same color as the roof – Tumbled Glass. It was a bit of messy process, but the trees work nicely with the house. They actually match better than in the photos as they are not quite as green as they look in the photos. When will the Pattern be available? NOW! 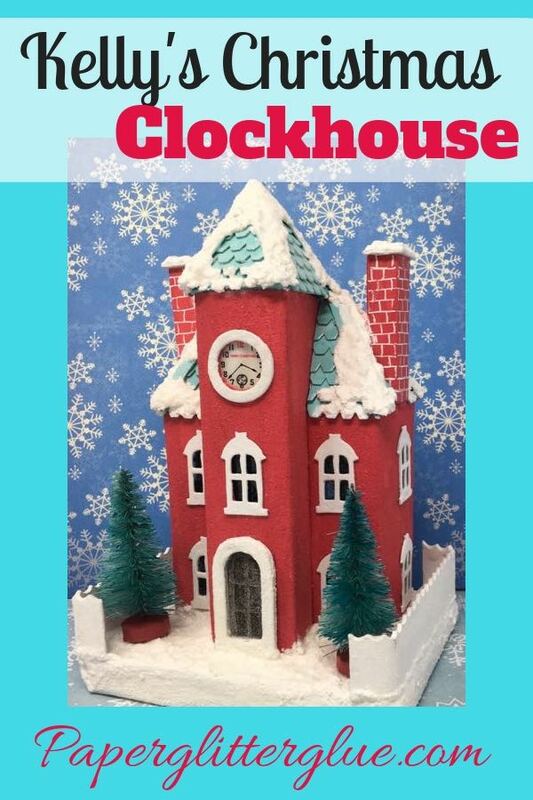 You can find it under the title “Front Tower Clockhouse“ in the Paper Glitter Glue library. Just subscribe to the newsletter to get the password to the library. P.S. 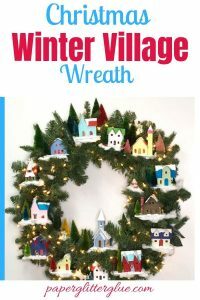 Subscribe to my newsletter to keep up with the craft projects here. Follow me on Pinterest because I am pretty good at finding cool stuff for inspiration. And pin this to your favorite Pinterest Board. Love the colors you used! It looks great. You are such an inspiration. I’m following your blog closely and can’t wait for every detail. 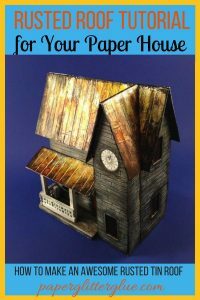 I’ve ordered some house dies to start and will go from there. Jennifer, I am so glad you like the colors. I just wish I had painted the fence or punched some kind of design in it. But that’s the way it goes. We always second guess ourselves, don’t we? Thank you for stopping by my blog. If you have any questions, I will be glad to help. You can leave a comment in a post, email here at Lucy@paperglitterglue.com or go to my Facebook page. Whatever is most convenient.